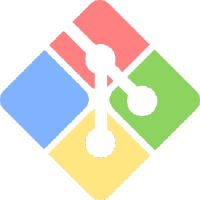 Jun 03 18:53:13  That would help having a good ROS self-hosting system with git support. Jun 03 18:53:34  (the git assertion part only). Since ReactOS target platform is Windows Server 2003, Git version 2.10.0 was chosen for the investigation — it’s the last one supporting Windows XP and 2003. Jun 03 19:04:57  yes I know, I've seen the code yesterday. The question is why it's FALSE on ROS but TRUE on Windows. Jun 03 19:08:48  good question! Jun 03 20:16:09  that's everything but standardized function. Jun 03 20:16:24  x86corez: ollydbg should work on ROS. Jun 03 20:16:30  what are you breaking today? Jun 04 02:23:40  it prints! Jun 04 02:24:13  I wonder whether it's the same in windows, or not. 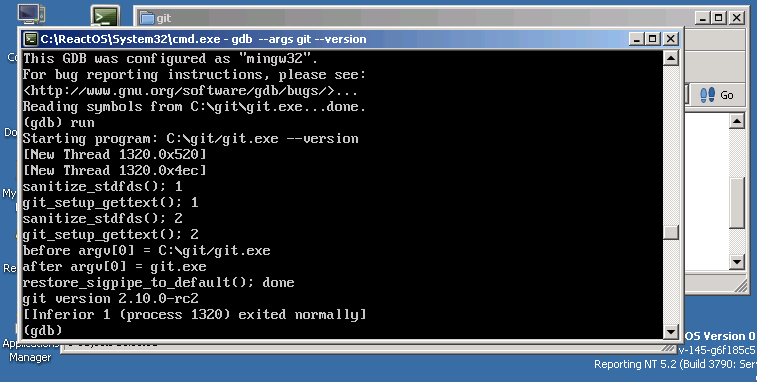 Jun 05 23:01:44  x86corez: can you try to run git also by not using cmd.exe? Jun 05 23:07:57  If there was a possibility to consult the received path, before looking at the contents of argvs... ? Jun 05 23:08:30  dump contents of actual command line? 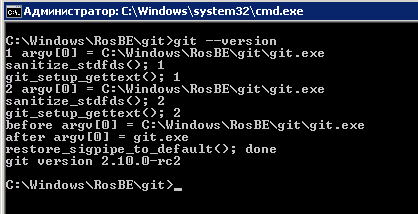 Jun 05 23:12:17  hbelusca, command line is "git  --version"
Jun 05 23:15:13  ok but then it would be nice if these different results are at least the same on Windows and on ROS, so that we can 100% exclude problems outside of msvcrt. Jun 05 23:00:17  just an empty file? Jun 05 23:00:49  mjansen: do we support these .local files? Jun 05 23:20:12  good idea about patching! Jun 05 23:25:37  ah, so as soon as git uses our msvcrt we get the problem on windows. Now we hit the same assertion, but already in Windows! And that means the source of our problems is in the one of ReactOS msvcrt functions. It’s also worth to note that the assertion message is displayed correctly in Windows. Jun 05 23:26:13  but it prints text and correctly. Jun 06 00:07:57  When a program is run from the command interpreter (Cmd.exe), _pgmptr is automatically initialized to the full path of the executable file. Jun 06 00:08:50  That's what GetModuleFileName does. Jun 06 00:10:30  Of course in ROS msvcrt we don't do this, but instead we initialize pgmptr to what argv could be. Jun 06 00:11:08  That's one thing. Jun 06 00:11:34  The other thing is that nowhere it appears (in MS CRT from VS, or in wine) that argv is initialized using pgmptr. Jun 06 00:34:26  hbelusca, IT WORKS! Jun 06 00:35:18  So it seems that something uses pgmptr to rebuild an argv. Jun 06 00:36:21  2.10.0-rc2? not the release? Jun 06 00:36:24  ok I'm gonna commit that stuff. 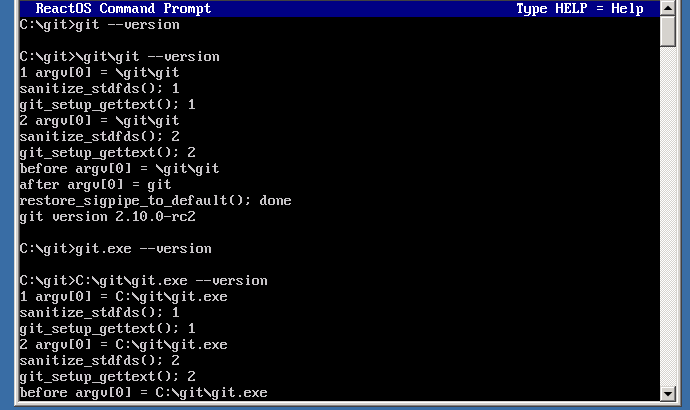 Jun 06 00:39:46  git 2.10.0-windows.1 (release) works too! Someone will probably wonder why I’m contributing to ReactOS and not Linux for example. So historically in most cases I write programs for Windows and my favorite programming language is Delphi. Perhaps that’s why the architecture of Windows NT together with the Win32 API is very interesting to me, and the ReactOS project of the free Windows alternative makes the old dream come true — it allows you to find out how everything works under the hood in practice. I hope you enjoyed my first english article here. I’m looking forward to your comments!